My uncle always says that what makes a really flavorful and complex sauce is the process of layering flavors and slowly adding and reducing stock - veal, lobster, prawn, you name it - whatever goes with your dish and preferably homemade. And of course - there must be butter. This recipe for Prawns with Spicy Black Bean Sauce involves that very process. First you make a prawn stock, then you continue to add it to the pan, slowly adding and reducing until you have yourself one damn good sauce. This is clearly more involved than most things I make, but worth the extra effort. I make it every few months and my husband and I eat seconds, then thirds and maybe one last little nibble while doing the dishes. Even my daughter demands "more pwans!". 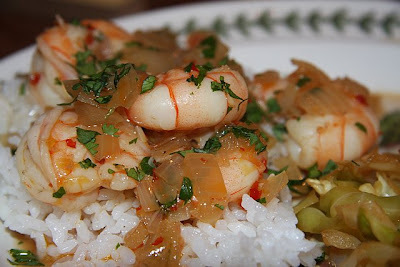 I bought wild Louisiana prawns from Mutual Fish. I always go there for prawns and they never disappoint. I serve over white rice and with a side of Orangette's Cabbage with Hot Sauce. Shell prawns and set aside for stock. De-vein prawns, rinse and set aside. Saute yellow onion in olive oil and 3T butter over medium high heat, making sure not to brown (all that oil and butter should prevent that). Add garlic and shallot. Saute for a few minutes. Add white wine and allow to come to a quick simmer. Add 2 cups stock, black bean sauce, chili garlic sauce, and a touch of Sriracha. Let sauce come to a simmer again and then reduce. 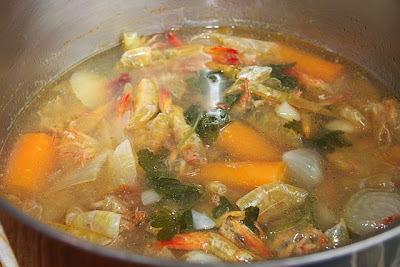 Add prawn stock gradually, one to two cups at a time, and allow to reduce before adding additional stock. Add more black bean sauce, chili sauce, or Srirachi if you like. After adding your last bit of stock, reduce until it’s a good amount of sauce but not too liquidy, stir in 1T butter. Then add prawns and cook for a few minutes on each side. Sprinkle with cilantro and serve over white rice with lots of sauce. Throw everything in a big pot, cover with water and bring to a boil. Reduce heat and simmer for 2-3 hours. Strain out liquids. Store in refrigerator for a few days or put in glass jars in the freezer until needed.